Ever since the crash several years ago, Americans have felt precarious about the nation's economy and the value of its currency. Money seems to take inconceivable, abstract, and even magical forms, traveling around the world at lightning speed with little oversight and obvious mismanagement. We have little control over it -- the value of our currency is tied to conditions well beyond our control. It moves in directions that most of us are vehemently opposed to. We trusted that the banks, Congress, the Federal Reserve, corporations and Wall Street are managing money responsibly on our behalf, particularly retirement funds and mortgages, but lately that trust has been broken. In response, the concept of local currencies have drawn interest from Occupy and other economic resistance groups as an alternative to state-controlled money. Since the Federal Reserve Act of 1913 there has been a relative monopoly on money issuance by private banks through the Federal Reserve, which has drawn criticism from groups like the Monetary Reform Institute. But for most of America's history, citizens used local currencies to meet their needs through local business, which often produced their own money. Before the Civil War, there were thousands of local currencies, and during the Great Depression they made a comeback, with hundreds of currencies used by the unemployed in particular. Local currencies generally develop for one of two reasons -- the desire for local economic control (for a variety of reasons, from democracy to sustainability to social justice,) and a scarcity of national currency. In the current situation, both reasons weigh heavy. When designed well and appropriately for the specific context, local currencies can boost a local economy and reward important work that needs to be done. Where national currency is not available because of overall scarcity or there is not enough market value for the work, local currencies can create real, tangible wealth we can see and control. Investing in community currency means investing in your community's health for the long haul, and therefore your own security and happiness. When money is spent in chain stores, national currency leaks out of the local economy electronically to their headquarters elsewhere. Community currencies prevent this leakage of resources and energy to entities beyond our control and recirculate local wealth through the multiplier effect an average of three times more wealth (45 cents on the dollar for local currencies compared to 15 cents on the dollar for federal currency recirculating). They support local business by providing more loyal customers, increasing local employment and buffering them from the shock of a boom-bust economy. While currency experts are working on interchangeable currency platforms on an international scale, alternative currencies function as complements to support the local economy, not competitors with the national currency, which is currently more ubiquitously useful. In the tiny country of Switzerland, the WIR Bank is a nationally circulated complementary currency by a cooperative of Swiss small- and medium-sized businesses that issue credit to each other based on rating and collateral. With over 60,000 member businesses, WIR currency circulates the equivalent of 1.65 billion Francs annually, helping small business get off the ground or expand, and allowing them to compete with international businesses and make it through tough times. It provides loans when national currency has dried up. GETS is a similar mutual credit B2B currency, with much more versatility, coming out of the UK and spreading to business networks in the US, like Green America and Vermont Businesses for Social Responsibility. Across Europe and Africa, thousands of LETS (Local Employment Trading Systems) like Community Exchange Systems and Community Forge provide local businesses, the self-employed, the underemployed, the creatively employed, and many radical idealists with a digital currency to organize and lubricate the informal economy. LETS are similar to commercial bartering systems, but use complementary currencies in an almost immeasurable variance of forms and structures, designed and controlled by the local community to meet its needs without money. LETS often consist of an online directory of goods and services offered by individual members and businesses and an accounting system. LETS credits are more abundant form or currency as a member can earn as many credits as they have time to work for, rather than waiting for scarce dollars to be available from bank accounts. Greeks in the midst of economic crisis have adopted a LETS currency called TEM, which has a Craigslist like directory and a digital and check-like currency form. One specific and popular variance of LETS in the US and UK is called a Timebank. Timebanks have special qualities that make them particularly useful to the poor and underprivileged. They value everyone's hours equally, intentionally fund community service and development work that it often unfundable, and they operate more like a relationship-driven gift economy than a currency, with generosity the rule. Some have a reputation system built in to encourage good behavior. Timebanks tend to share core values that everyone's life and work are valuable, that everyone should be cared for equally, and that reciprocity and caring are key to a healthy economy. Timebanks have proven superior to money in applications such as senior care, disabled peer support and childcare and nonprofit service provision. In New York and Montpelier, Vermont, and St. Louis, Timebanks have received large government grants to facilitate mutual assistance care for the sick and elderly in a more economically sustainable than the government can facilitate, as well as creating community amongst socially isolated people. The Visiting Nurses of New York Timebank conducted a study demonstrating remarkable impact in facilitating new friendships across cultures and languages and improving self-reported mental and physical health. Timebanks in their modern form originated in the '80s, but only recently took off, now numbering in the hundreds. They were also popular during the Great Depression amongst hundreds of thousands of members of unemployed associations that created a self-sufficient parallel economy, getting most of their needs met and orchestrating manufacturing, education, and more through exchange of hour credits, like the UXA. International Timebank organizations include OS Currency, Timebanks USA, hOur World, and Time for the World. Whereas Timebanks and LETS have not yet succeeded in capturing a significant portion of the formal economy, community paper scrips have stepped in to fill the need. Berkshares and Ithaca hours are two successful versions of local scrip invented in the U.S. to support local business. Berkshares are a discount community currency backed by $USD that are widely accepted by businesses and banks in the Berkshires region of Massachusetts. The scheme is similar to the German Chiemgauer, which is a regional paper currency with negative interest built in (through required expiration renewal stamps). The Chiemgauer has succeeded in encouraging local import replacement businesses, like apple production, driven by flood of local currency that businesses accumulate from customers and only spend at other local businesses. Ithaca hours are issued by a nonprofit for membership, providing the goods and services based on trust in community, as well as transportation - the hours are accepted by the local transit authority. Other scrips or paper currencies are popping up across the country from Corvallis Hours, to Detroit Cheers, to the Washington D.C. Potomac and Sand Dollars (New Earth Exchange) in Santa Cruz, CA. Many can't get off the ground with out financial support, while other struggle along until their currency is worth valuable services or goods. Credit card forms of business-backed currency that function more like local business rewards or discount cards are gaining ground to compete with the modern efficiency of digital money, like Sonoma Go Local, Bernal Bucks and the City government initiative, the Oakland Acorn -- all in the progressive nexus of Northern California. Both Bernal Bucks and Sonoma Go Local are planning on using their reward funds to support local business development when conventional loans are unavailable or at too high interest. Many local currencies also make grants to nonprofits. In Brazil, over 50 community banks have drastically reduced poverty by issuing their own paper and credit card currencies based on the Banco Palmas model. Palmas are issued into circulation to fund community and infrastructure development projects and as small business loans and personal loans, dispersed based on community reputation rather than capital or collateral. They are run by community-based organizations. Local businesses and nonprofits directly incubated from Palmas advance the lives of youth, women, the poor, and artists. Palmas type currencies now help many Brazilians meet most of their needs locally, and invigorate the local economy with a charge of currency and employment. Palmas have proven so successful in alleviating poverty that they are now supported by the Brazilian national government. Venezuela has been experimenting with the Palmas model and it is widely promoted by the Chavez government. Still in use today, Argentina's grassroots currency initiative, called the Red de Trueque, emerged to provide a third of the country with a means of exchange for basic needs during its economic crash in 1999, when large banks frozen resident's accounts and fled the country with currency. Woergl, Austria provides a brief but inspiring example of a municipal issued currency that pulled the city out of an economic crisis during the Great Depression. It functioned by spending into circulation depreciating local currency backed by public works, providing a dramatic 30% unemployment relief rate in in one year. It was crushed for its wild success by the national government as a grassroots threat to the national currency. Instead of placing faith in the "economic experts," these currency projects are built on faith in community and the creation of real wealth. When carefully designed, they can be a source of community empowerment, prioritizing caring relationships and community values ahead of profit as well as and generating meaningful employment at local businesses. As shops shut down around us, municipal governments cut services, and the unemployed fall through the widening crevices in our economic system, perhaps its time we take our economy into our own hands. As these projects demonstrate, democratically controlled local money can be a powerful tool in shifting economic power and transforming the economy into a more loving and sustainable one. 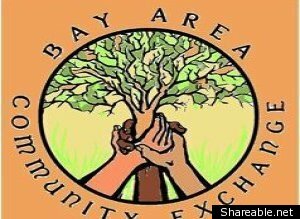 For more information about local currencies, see the SF BACE library, Community Currency Magazine, and the Complementary Currency Database.